The UK government has come under pressure from SNP MPs to do more to tackle gambling related harm following a debate in the House of Commons pressing for key reforms over problem gambling. 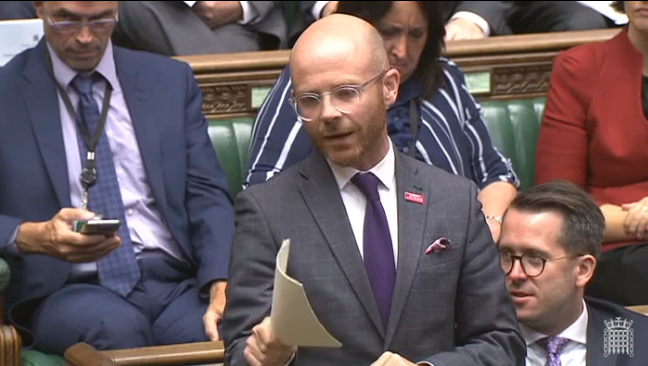 Speaking during the Westminster Hall debate, West Dunbartonshire’s MP Martin Docherty-Hughes voiced concerns that the huge profits of bookmakers greatly outweigh the resources that local authorities have to address gambling related harm. Last year the total gross yield of gambling across the UK was £14.4 billion. As the profits of gambling companies continue to rise so do the number of people affected by problem gambling, with an estimated 430,000 people across the UK addicted to betting – and a further two million others at risk. In 2018, the UK government was forced into action over Fixed Odds Betting Terminals (FOBTs) following pressure by SNP MPs and campaign groups. As a result, the maximum stake for FOBTs is being reduced to £2 which comes into force in April next month. SNP MPs at Westminster are now leading calls for a joined-up strategy across UK government departments to address the harm to communities being caused by problem gambling. Ministers are being asked to consider a statutory levy of 1 per cent on bookmakers to help tackle gambling related problems. “The steps taken to reduce the maximum stakes allowed on Fixed Odds betting terminals are to be welcomed, but it’s clear the UK government must do more to tackle gambling related addiction. “Whilst the majority of people gamble responsibly, there is an alarming increase in the number of people becoming addicted to betting which is causing significant harm in our communities. “Gambling addiction is destroying lives and ruining families not just in West Dunbartonshire but in communities across the country. “The amount of money spent by bookmakers to promote gambling far outweighs the resources and means available to local authorities to counteract that. “The Scottish government is taking action to address the proliferation of betting shops in deprived areas, but whilst gambling laws remain reserved to Westminster we must continue to press the UK government to do more to address the scourge of gambling addiction.